We find Conflict in every workplace — even the home office. Too often, we deal with it by suppressing it. Dealing with Conflict openly and directly is a key to building a high performance organization. Yet sometimes, it's just too difficult to talk about. But mark your calendar! April is Workplace Conflict Awareness Month! This April, plan something to help the people you work with come to peace with conflict. Take advantage of April to talk about Conflict without people taking it personally. You'll do more in April to raise productivity than all the downsizing, reorgs, acquisitions, spinoffs and what-not have done in the past decade. We find Conflict in every workplace — even the home office. Too often, we deal with it by suppressing it. Dealing with Conflict openly and directly is a key to building a high performance organization. Yet sometimes, it's just too difficult to talk about. But mark your calendar! April is Workplace Conflict Awareness Month! This April, plan something to help the people you work with come to peace with conflict. Take advantage of April to talk about Conflict without people taking it personally. You'll do more in April to raise productivity than all the downsizing, reorgs, acquisitions, spinoffs and what-not have done in the past decade. 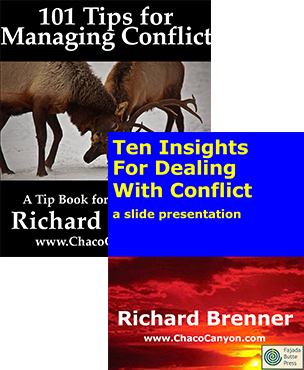 The kit includes a 15-slide PowerPoint presentation that you can use to kick off a discussion of conflict in your organization. And it includes Ten Things to Do For Workplace Conflict Awareness Month — ten great ideas for organizations that want to deal with destructive conflict. 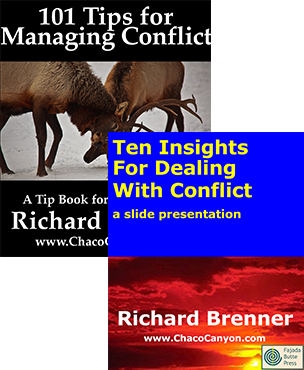 You also get a copy of my tips booklet 101 Tips for Managing Conflict . Workplace Conflict Awareness Month Kit is in Acrobat format, which gives you several advantages. You can print it, and read it like any book. Or in electronic form, you can use the search capability of Adobe Reader to find passages of special interest to you. If you load it onto your laptop, tablet, or other mobile device, you can read it anywhere — and it's weightless, too.